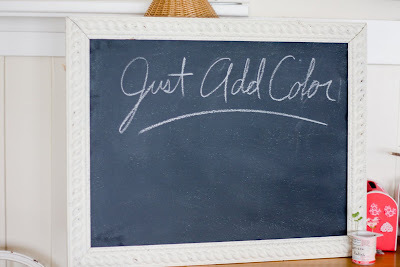 A while back I made a chalkboard out of an odl frame, a piece of wood and chalkboard paint. I love chalkboard paint. If I could, I would probably cover a whole wall with it, or a door, or something else. But I exersice self control in this area - probably because I don't have much of a choice. Then I thought of something, I got these really awesome huge pails from Tuesday Mornings before Harrison was born; before he even had a room. They were a fraction of the cost of the same thing at Pottery Barn Kids, only they had words on them, 'Toys', 'Crayons', 'Pail'. Last week I painting right over those words with chalkboard paint so that we could write anything one them. Then as the contents change - so can the description! Okay, off to do laundry now! AM SO STEALING THIS IDEA!! I love the chalkboard, I've several frames I've been meaning to make into bulletin boards - but maybe I'll do chalkboards instead? 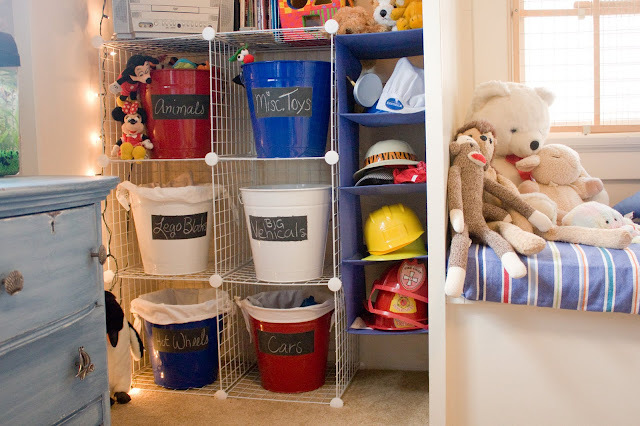 But Love the buckets - they are cuter than Pottery Barns actually! good idea! I wish we had pottery barn near us!! Nothing better than a chalk board, seriously! I have been wanting to try chalkboard paint. You have reinspired me. The buckets turned out SO cute.